Vincent Del Bosque meanwhile, is also sticking by his tiki-taka guns. TEAMS CAN RECOVER from losing their opening match, Spain proved that themselves in 2010 when they rebounded from defeat to Switzerland to win the tournament, conceding only one more goal in six matches. What they might not be able to recover from is an opening game against the Netherlands that follows the same lines as their last meeting. Johannesburg played host to a fiery World Cup final four years ago and this afternoon they will get reacquainted in Salvador, the largest African city outside the continent of Africa. It is unlikely this city of three million people will witness a match as attritional as the battle played out four years ago. Vicente Del Bosque yesterday described as “brutal” some of the Dutch play in 120 minutes of football that saw 14 yellow cards shown — nine for the Netherlands, who were lucky to only have only Johnny Heitinga sent off by Howard Webb, the English referee inexplicably showed Nigel de Jong only a yellow card for a kung-fu attack on Xabi Alonso. Were the Group B curtain-raiser to follow similar lines you would fancy Chile and Australia’s chances of picking up results against the top two seeds in subsequent matches. Neither Spain’s European Championship and World Cup winning coach Del Bosque, nor his Dutch counterpart Louis Van Gaal, are likely to allow their players to open the throttle at Arena Fonte Nova today and goals could be as hard to come by as they were in 90 minutes at Soccer City four years ago. While the Netherlands have undergone something of a reinvention since then, with the development of young stars such as full-backs Daryl Janmaat and Daley Blind, midfielder Jordy Clasie and attacker Jeremain Lens, Spain are still very reliant on the core group of players who ruled the world in 2010. Full-backs Jordi Alba and Juanfran are valuable additions, as is Brazilian-born Atletico Madrid goal-machine Diego Costa, but Spain’s approach has not changed. “We will win or die by our philosophy,” said their Plato, Xavi Hernandez, who has done more than anyone to make the pass-dense, possession-reliant “tiki-taka” the dominant style of the last decade. However Xavi and the other key cast members are not getting any younger and a relentless club and international schedule since 2008 has taken its toll on Xavi (34), Xabi Alonso (32), Andres Iniesta (30), David Villa (32) and Fernando Torres (30). 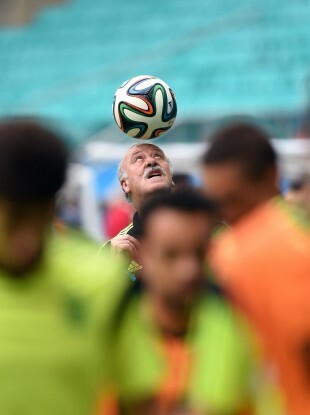 “All the players we have brought to Brazil have their own history in the squad,” said Del Bosque. “They are still playing well for their clubs. It is very mature, at its best. We have some young players and a few players who are 30 or a little over. That’s not a lot. His captain Iker Casillas, at 33, is another ageing component but the goalkeeper’s workload has been lessened since losing his place as Real Madrid’s La Liga goalkeeper. He still kept nets for the club’s “La Decima” Champions League success, which did not satiate his hunger for glory, judging by his comments at this evening’s (THURS) pre-match press conference. “I think we are motivated. Our goal, while always respecting the opposition, is trying to get a second star,” he said. Van Gaal, for his part, appears to be taking no chances in the first game of a tricky group — lose to Spain and a dangerous-looking Chile, who the Dutch face in their final Group B match, will smell blood. With the likes of Arjen Robben, Wesley Sneijder and Robin Van Persie involved attack will not be the Achilles heel, but where the Netherlands once had the experienced and aggressive Giovanni Van Bronkhorst and Mark Van Bommel at the back they are now reliant on Aston Villa centre-half Rob Vlaar and Bruno Martins Indi of Feyenoord. Van Gaal has looked to shore up this potential weakness with a third centre-half, Stefan de Vrij, in a conservative 5-3-2 formation. The future Manchester United manager admitted he would adopt a defensive strategy in last night’s press conference. “What do we need to do? They are the number one team in the rankings and we are number 15, so it is very important we play a compact game when the opponent has the ball and when we have possession we have to skip stations. But it won’t be easy because of the resistance of the Spanish team,’ said Van Gaal, who defended the approach taken by his predecessor Bert Van Marwijk in the 2010 decider. “I believe that physical resistance is part and parcel of football, part of the profession. There is a referee who will point out what the limits are. The team four years ago didn’t cross the line,’ said Van Gaal. This afternoon could be more a tactical struggle than a physical one, and Spain look equipped to come out on top by the narrowest of margins. Email “Van Gaal making no apologies for defensive approach to thwart world champions Spain”. Feedback on “Van Gaal making no apologies for defensive approach to thwart world champions Spain”.